“Hans [Christian] Andersen slept in this room for five weeks – which seemed to the family AGES!” – A note in Charles Dickens’s house. Last time the Fairy Tail wizards were trying to find the pieces of a magical clock, while all the time battling against the Legion wizards working for the Zootopia Church. However, by the time Fairy Tail manage to collect the pieces, they learn too late that this is actually the one thing that they should NOT do. The pieces are part of a gigantic magical device called the Immortal Clock, which, when activated, will release a spell called “Real Nightmare” that has the power to alter the perception of time and cause chaos across the world. They also learn of the identities of the people who are responsible for all this troublemaking – the Dark Guild Oracion Seis – or rather, the reformed Dark Guild Neo-Oracion Seis. The guild, consisting of among others the poison Dragon Slayer Cobra, old Sir Erigor of Esienwald who now refers to himself as Grim Reaper and controls storm magic, and Midnight who now calls himself Brain II, have been responsible for the attacks on churches. Except that it is not the buildings they have been attacking, but celestial wizards protecting the clock. They have been manipulating everything to suit their own ends, including which ones of Fairy Tail’s wizards end up facing them in battle. To top it all off, Neo-Oracion Seis has another member called Imitatia, a wizard capable of impersonating people. The person she has been imitating all this time is Michelle Lobster, Lucy’s supposed relation, who takes Lucy and Natsu prisoner. Natsu is locked in Zootopia’s prison, while Lucy is taken to the Immortal Clock, because for it to work it must be controlled by a celestial wizard, and she is to be forced to make it go. 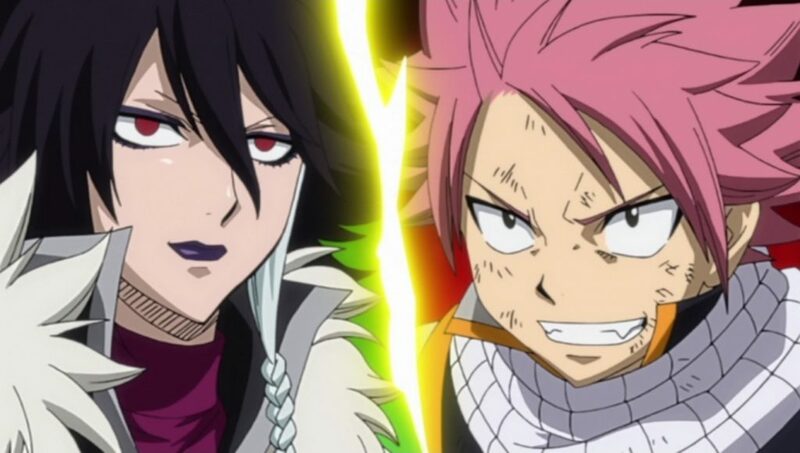 The rest of Fairy Tail, and later the previously tricked Legion wizards, end up having to try and bust Natsu out of the nick and free Lucy from her plight. After this is all over, there then comes the matter of some other important guild business. Makarov decides to make Gildarts the new master of Fairy Tail, but before he does so, Gildarts goes away on another trip leaving just two instructions: allow Laxus back into the guild, and make Makarov guild master again. 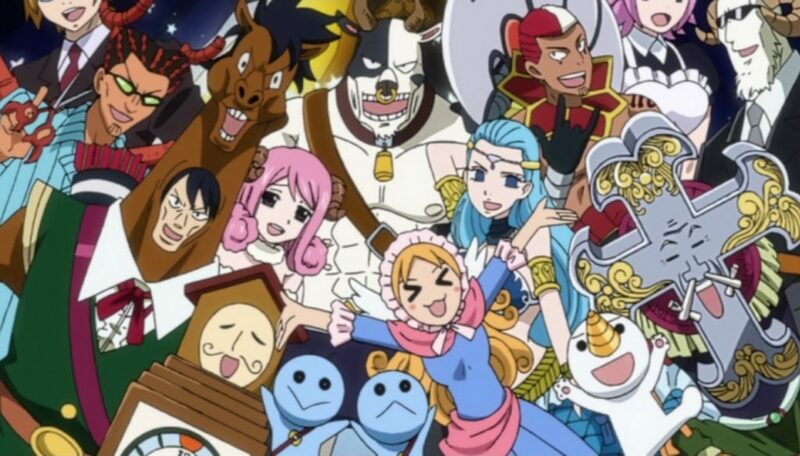 The other important matter is that over the past seven years (during which many of Fairy Tail’s wizards went missing) Fairy Tail has now become the worst ranked guild in the land, with the new top guild being one called Sabertooth, which has two Dragon Slayers in it: the White Dragon Sting and the Shadow Dragon Rogue. The fastest way to reach the top is to enter into a competition called the Grand Magic Games tournament, which Makarov agrees to, chiefly because of the vast prize money. The problem however is that the likes of Natsu, Gray, Erza and Lucy are all seven years behind mastering the magic abilities, with only the worst wizards making any progress in that time. Thus they need to make progress over the next three months, but then Lucy is summoned by Virgo to the celestial spirit world which is in danger, taking several other wizards with her. As a result, time that could be used for training might be getting wasted. In this collection, one of the main attractions is the difference in tone between the two story arcs that appear in it. The first is dark, menacing, and contains its fair share of conspiracy in the Zootopia Church. You also have the subject of betrayal when you discover Michelle’s true identity, but this becomes even more so when you discover that not all the members of Neo-Oracion Seis are who they appear to be, with their memories being manipulated. The story does however have a nice pay-off with the relationship between Lucy and Michelle being fully explained. The second story arc appears to be jollier, with it seemingly about a contest between wizard guilds, although we have only just started the arc. There is, as seems obligatory with long-running anime series like this, a beach episode, but also we start to learn more about the dragons as well. One other major factor to be highlighted in this second arc is that it is also arguably the last arc. 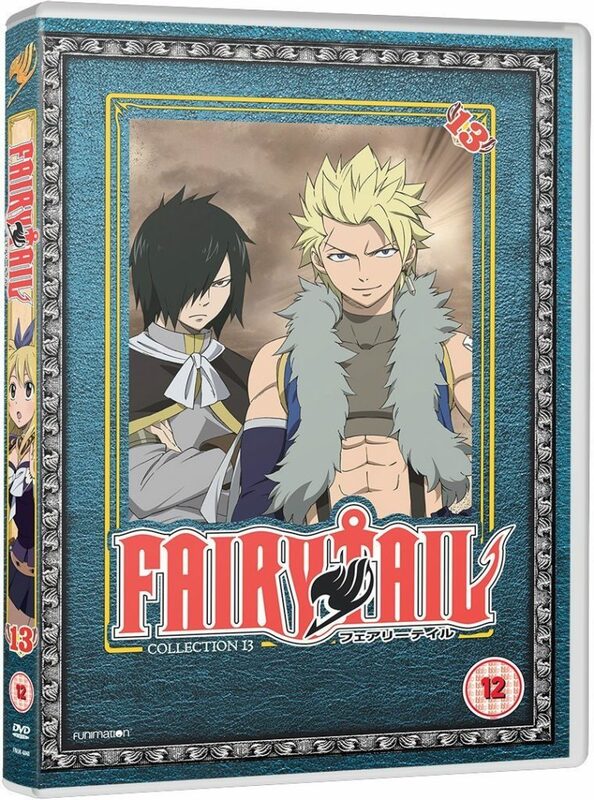 We are now coming to the end of the first series of Fairy Tail, which ended in March 2013 and then went away for a year. There are only two more collections in the first series left to go, so it is interesting to see how this conclusion builds up. This time, all the extras in this collection are just on the second disc. There are episode commentaries, trailers, interviews with Todd Haberkorn and Newton Pittman (the English dub voices of Natsu and Gray), and textless opening and closing. This includes new pieces of music, “Break Through” by Going Under Ground for the opening; and my personal favourite of the two, “Kimi ga Kureta Mono” by Shizuka Kudo. We come to the conclusion of the Grand Magic Games arc, and it is a conclusion full of shocks and destruction.